The Green Bay Packers selected back-to-back corners in the 2015 draft but Damarious Randall and Quinten Rollins turned out to be major disappointments. Randall is now with Cleveland and Rollins is recovering from a torn Achilles. In great need of corner help, the Packers spent back-to-back picks at the top of the draft, with a little wheeling and dealing mixed in. 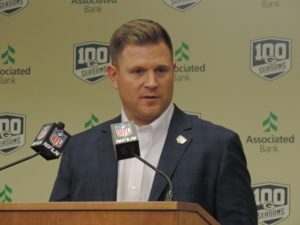 GM Brian Gutekunst selected Jaire Alexander (CB) out of Louisville with the 18th pick in the first round. He came back the next day and selected Iowa’s Josh Jackson with the 45th overall pick. Gutekunst started the day on Friday not thinking about taking another defensive back, but when Josh Jackson was still on the board, that changed things. Jackson had a fantastic season at Iowa last season. He led the nation with eight interceptions. He had two last season that he returned for touchdowns against the Badgers. The Packers followed up by moving back into the third round and selecting Vanderbilt linebacker Oren Burks with the 88th overall pick. Burks ran a 4.59 40-yard dash at the NFL scouting combine and the Packers are hoping he’ll provide coverage in their sub-package defenses. The Packers started the third and final day of the daft by selecting Missouri wide receiver J’Mon Moore, then added the teams next potential starter at right guard with the selection of Washington State offensive lineman Cole Madison with the first of three fifth round selections. Following Madison, the Packers picked punter J.K. Scot from Alabama and wide receiver Marquez Valdez-Scantling out of South Florida. In round six, the Packers selected their third wide receiver of the day, Equanimeous St. Brown out of Notre Dame. Three more picks followed in round seven, selecting California defensive end James Looney, Mississippi State long snapper Hunter Bradley and Southeast Missouri State linebacker Kendall Donnerson. The Packers entered the draft with 12 picks and ended up selecting 11 players. They picked five defensive players, four offensive players and two special teamers. They also signed 15 players as undrafted free agents following the end of the draft on Saturday.